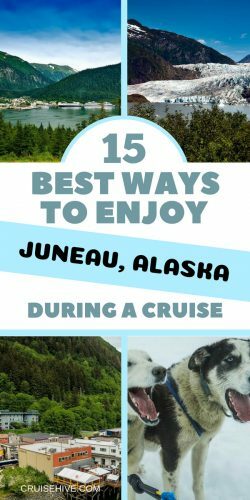 If you are planning a cruise vacation to Juneau, Alaska then here are all the things you can do to make sure you have the best experience. 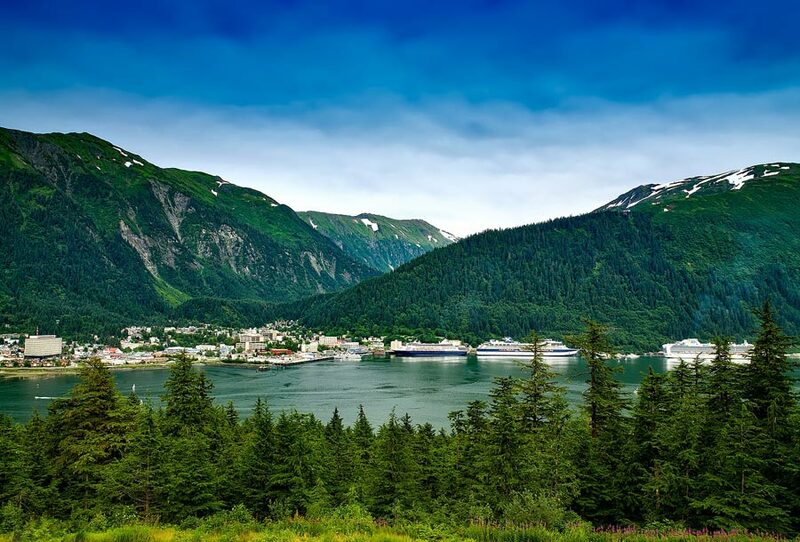 When planning your cruise vacation you’ll want to cruise to Juneau, Alaska. This town is larger than most common big cities in the US and is the second largest city in terms of area. Interestingly enough it has no roads connecting it to the rest of Alaska. You can only visit the place via plane or boat! Nestled between towering mountains and glaciers, Juneau has the perfect balance of raw natural beauty and comfortable modern living. It’s no wonder hundreds of thousands of cruisers visit this destination annually. A cruise to Juneau means enjoying the beautiful glacial scenery, a rich history of pioneer gold rush and an incredible wildlife experience that features the likes of bears, whales, sea lions, bald eagles’ porpoises and varied fish life. Your ship will dock on either one of the three berths found near the city center. 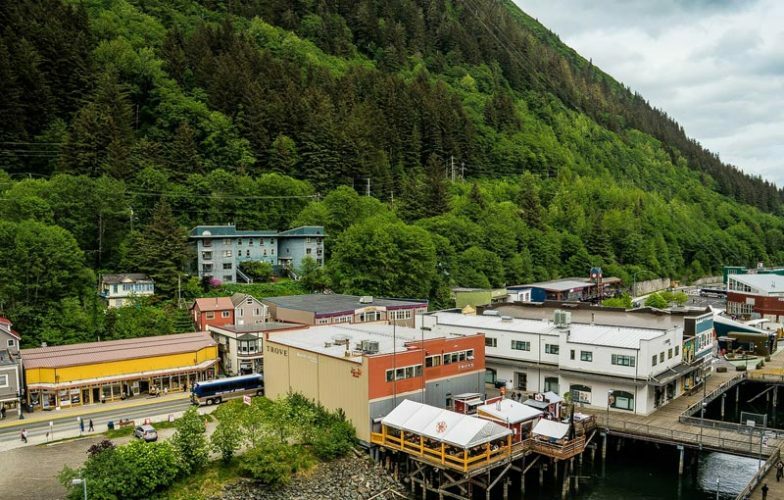 This makes it easy for you to just debark and start exploring beautiful Juneau. However, if the berth is full you might be forced to tender. Get all your cruise accessories from Amazon before your vacation. Once you exit the pier at Juneau you will find an excursions desk and lots of shopping stalls. Shop, eat and explore the town. Points of interest in Juneau town include the state capital building, the governor’s mansion and old St. Nicholas Orthodox church. Visit the state capital building and enjoy a 30 minutes free tour which gives you the rich history of the place. The interior decor and the furnishing at the lobby is something to see. The exterior of the building and the replica liberty bell in front offer a good photo op. Moving on you will come to Juneau-Douglas museum just neighbor to the Capitol building. Here you will learn the history and culture of the Tlingit people. On Calhoun Avenue, you will come across the governor’s mansion which is an architectural wonder. You have a chance to take more photos here. Visit Alaska state museum situated just a few minutes from the cruise pier. This is a history buff’s paradise. The museum takes you through the history of the Alaskan people, the Russian occupation, the gold rush and how all this influenced Alaska then and now. This is the best way to see Alaskan artifacts and it’s a nice option other than shopping when in Juneau. The museum also displays wreckage of SS Sophia, a pedestrian steamship that wrecked in an interesting yet tragic story. One of the most popular activities to do in Juneau is to hike up Mt. Roberts. The mountain is located on the southern side of Juneau. And is only a 5minutes ride from the cruise ship pier. By, ride we mean you can take an exciting tram ride 1,800 feet above the ground to ascend to the top of the 3819-foot mountain. This ride spreads out the entire Juneau and its surroundings before your very own eyes. Enjoy the panoramic views of this beautiful destination that are afforded you by the tram ride. You’ll need hiking shoes for this kind of adventure, get some here. However, if you want to burn some calories or feel like taking a hiking challenge, then hiking up the mountain is the other alternative. The hike up Mount Roberts is exciting and not devoid of natural wonders. The mountain has well-marked trails, that you can follow. Enjoy the lush green of the forest, as natures sounds wash over you. The tram ride costs $34 per adult, $17 per child and it’s free for people below the age of 5. Ziplining is a fun way to spend part of your day away from the crowds. Visit Douglas island located west of downtown Juneau. Most of the island is inaccessible by vehicles except for the one road that will take you to the middle of the island. This is where you can ski in the winter or go ziplining in the summer. The zipline course features seven zip lines, hosted on 10 platforms with a suspension bridge installed between giant Alaska pine trees. Get your fill of adrenaline rush on this amazing course while a charming and friendly guide gives you the history of the area. The ziplines are safe as well and fun for almost all ages. Douglas Island is not only good for ziplining but it’s where the Eagle crest ski area is found. If you are in Juneau during winter this is the place to be for more fun on skis. During the summer, the area acts as a hiking and mountain biking site. Therefore, regardless of the season, you visit Eagle Crest, there is always something to do. Juneau locals call it “out the road”. Take the only road in the town that stretches 42 miles from one end of the town to the other. This road to nowhere offers you a scenic view of Alaska’s coastlines. On your way to nowhere, you can check out Auke Bay, Eagle Beach, Mendenhall Glacier, and the shrine of St. Therese. Be sure to carry your camera there are numerous photo ops on this ride. One of the most popular things to do in Juneau is to visit the Mendenhall glacier. 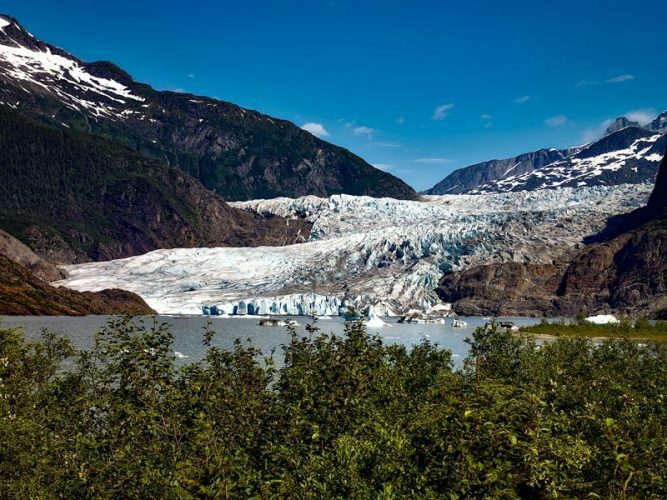 This 3000-year-old glacier is found 12 miles east of downtown Juneau. It stretches 12 miles and is home to varied wildlife including black bears and salmon fish. This place also bears many hiking trails. One of the best trails is the steep creek trail. One of the most interesting stops at this site is the Mendenhall Glacier visitor’s center. This is a rather interesting visitors center, set in a science-museum kind of fashion. The guides at this place give interesting information about the glacier and you get to watch a short film about the history of the glacier. Other than watching the glacier, you can also shop for interesting souvenirs and books in the center. Surreal, amazing, otherworldly are common expressions used to describe this stunning ice caves. The Mendenhall Ice Caves are found in the Mendenhall glacier which stretches 12 miles east of Juneau. You cannot say you have visited Juneau if you haven’t been to the Mendenhall glacier. One of the most wondrous features of this glacier is the Mendenhall ice caves. These caves are formed from glacial ice left behind during the recession of the Mendenhall Glacier. Visit these caves to see the incredible blue ice ceilings that cover the caves. These caves are only accessible via a kayak or canoe and involve a bit of hiking to get to, but it’s all worth it in the end. Make sure you don’t take too long to visit these stunning caves. They are melting at a rapid rate due to global warming and may soon cease to exist. So, cease this moment to experience nature at its best. Just 2miles from the Mendenhall Glacier Visitors center is the 400ft long nugget falls. Take a hike (no pun intended) to these gorgeous falls. You will be captivated by the sheer beauty and roaring power of this mighty waterfall. Enjoy the crisp clean fresh air in the atmosphere around the falls. The best way to see icebergs up close is at Tracy Arm’s Fjord. This place is breathtakingly beautiful, towered on either side by steep mountains bearing ribbon-like waterfalls. The view is simply amazing, you have to see it, to understand. Tracy Arm is probably one of the best ways to watch a glacier calve as well. Other than the beauty of the place and dodging icebergs, itis also one of the major hotspots to watch orca killer whales up close. Don’t be surprised to see orca whales breaching and playing in the Fjord. You can’t visit Juneau and fail to go whale watching. Seeing these magnificent creatures in their natural habitat is a sight to behold. You might take one of the several whale-watching excursions offered. Some are done at Tracy arm’s fjord and others at Auke Bay. The excursion involves taking a boat ride out to the whale watching site of choice and watching these creatures through the glass windows or roof of the boat. While on this trip, you are guaranteed to spot a humpback whale or Orca doing some amazing tricks such as breaching, flipping, and feeding. Alaska is the perfect destination for outdoorsy people. If you love hiking then you will love visiting Juneau. This small town has over 250 miles of hiking trails in it’s more top 31 hiking trails. Some of the most popular hiking trails include the west glacier hiking trail, the east glacier loop, mount Robert trail and sheep’s creek trail. This are the most worn trails in the area. West Glacier trail is best for a hiking novice. It’s a challenging hike but the rewards are amazing when you get to the top of the glacier. How about the perfect hiking backpack for this? Take a look here. The east glacier loop can be accessed from Mendenhall Glacier visitor’s center. It leads you away from the crowds at the center to the forest and eastern sides of the Mendenhall Glacier. The trail affords you great views of the glacier and the lake beneath. Other notable trails include mount Robert trail, the alpine trail loop and nugget falls trail. 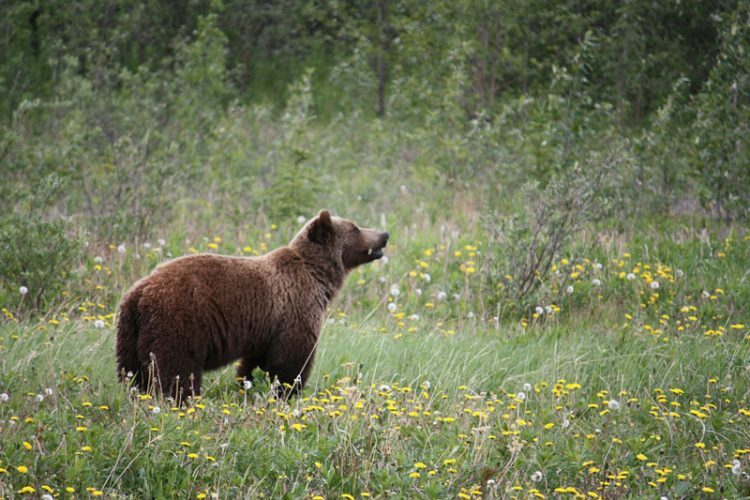 Another popular way to enjoy your vacation in Juneau is to go bear watching. This happens in admiralty island at pack creek. Take an excursion to go watch these magnificent creatures in their natural habitat. A 30-min float plane ride will take you to Pack Creek. This Creek has the highest population of brown bears in south-east Alaska, earning it the name “fortress of the bears” by the locals. Travel binoculars are a must for spotting those bears, get from Amazon right here. Alaskan is the perfect place to shop for art, and Juneau doesn’t disappoint. It has plenty of galleries showcasing local talent’s work. Shopping on this port starts right at the dock, with a variety of jewelry, clothing, and sculptures available at the shopping stands. However, be careful not to buy counterfeit goods. For more authentic finds venture further into the town, there you will find beautiful art, books, sculptures and more Alaskan inspired souvenirs. Find Alaska souvenirs from Amazon by clicking here. Glacier Bay National Park is one of the most popular attractions on the inside passage. This park is full of interesting things to do including kayaking, hiking, bear watching, exploring glaciers and the animals that live around them. It is located about 50miles north of Juneau and is worth a trip. Here is one more thing to tick off your bucket list. When in Juneau book the helicopter tour and dog sledding excursion. Fly over Juneau ice fields to get to Herbert glacier where your dog sledding adventure awaits you. 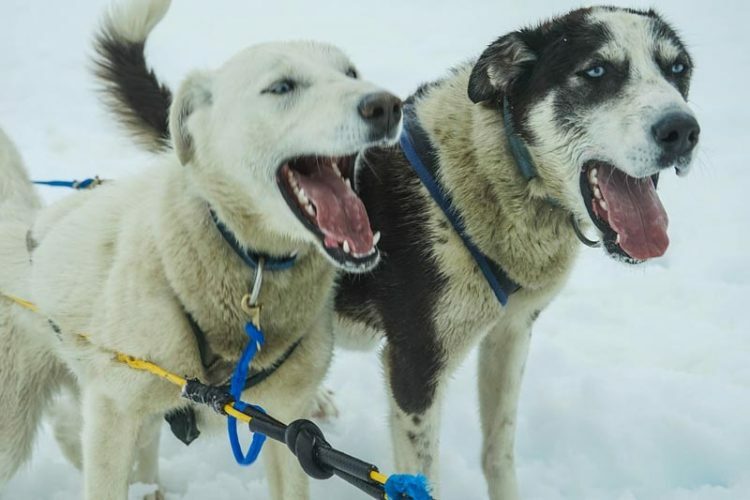 At the dog sledding camp, you will meet the musher who will guide your dog sled ride. As you can see Juneau, Alaska is chock full of adventures that any outdoorsy individual would enjoy. Other than what is already mentioned, you can also enjoy a helicopter ride over the glaciers, hangout like the locals at the Red frog bar or try your hand at ax throwing. The best time to visit this cruise port is during the summer season, from the months of May all through to September. The warmest months in this cold Alaskan region run from June to August. Please note that the waters of the Gulf of Alaska tend to be a bit choppy. Therefore, if you get seasick easily you are better off visiting Juneau from a north Alaskan cruise trip. Enjoy beautiful scenery, rich history, and culture and take plenty of surreal photos to remember the place by for you will surely miss it when the trip is done. That’s it enjoy your trip to Juneau, Alaska.